Zesty and sweet, like sugared citrus fruits, Citrus Sunrise takes you back to when life was simple and carefree. Featuring certified-organic essential oils, this roll-on perfume lets you display your playful spirit, with clean ingredients that appeal to your serious side that avoids mystery chemicals. Goddess Garden lists all their natural ingredients so you know exactly what you’re wearing, giving options to people with allergies, sensitivities or those who simply want to avoid hidden chemicals. 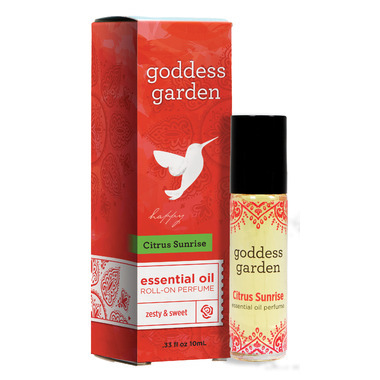 Created exclusively with scent in mind, Citrus Sunrise is a sophisticated perfume and not a traditional essential-oil remedy. With notes of bergamot, grapefruit and palmarosa, this uniquely beautiful perfume forms a complex aroma that feels as good to wear as you’ll feel about wearing it!